Are there certain original Follies images or things from your research that that really influenced your designs? GB: You know, it's very funny, I was working on a project a couple of years ago; before I knew that I would be doing Follies again, and the producer of that project had the most incredible collection of programs from the Ziegfeld Follies. Just because I'm a freak for Follies, there I was pawing through all of these old magazines. There were so many incredible images, and I didn't realize until I saw those that actually Florence had, in her journey with the original production, really looked at what people did wear in the Follies and then did her take on it. So I have done that same thing, especially with the ghosts, although Eric Schaeffer, who is directing this production, had a very specific vision that they not be too vibrant, that there is sort of a dark underpinning to the ghosts. My image is that they've been wandering in this beautiful old theatre for 50 years, and that just by the nature of these wanderings and the sort of waiting to see what happened to their lives, the clothes and the weight of the clothes, is sort of dragged down. So they don't look like Miss Havisham, but there's something about them. I think hopefully they'll operate on two levels: You'll think, "Wow, that's a fabulous Follies costume," but it will also have a sort of pathos to it, and the underpinning will be slightly dark. Audiences always anticipate that overwhelming moment where we fall into the Follies sequence and "Loveland." You get to run wild as a designer, I bet. Klotz's originals had cherubs and instruments all over them. How do you see this segment? GB: This is my bleeding ulcer: "Loveland." How not to disappoint, knowing that you are bound to disappoint some people. It's a rock and a hard place. What we did was, we are paying homage to the original production, but we're keeping it true to a sort of Baroque-showgirl kind of world. I studied. There is amazing YouTube footage of those rehearsals [of the original Broadway production of Follies], and you get to see those things in motion, and they are extraordinary. This is nothing like that, and I have never seen anything like that since. So what we tried to do is we lightened it up, the shapes are similar, and the themes are similar because it's in the lyric, but I am hoping that they have a slightly different air in them. Where as with the ghosts feeling like they've been dragged down and rooted to the floor, [the "Loveland" costumes] are almost as if they've just got the breath of life renewed and they are going to take off. So we are hoping that they are very billowy and sensual, and maybe to our 21st century eye, have a kind of glamour that is a different sort of glamour that they had in 1970, so hopefully that will satisfy all of my critics! Touching on what you said before about sitting with Linda Lavin and chatting with the actors about themselves and their characters, you are designing for people like Jan Maxwell and Bernadette Peters and Elaine Paige, some leading ladies with great bodies. That's got to be a thrill, too. How do you take your initial design instincts and then tailor that for the particular cast? There has to be a lot of collaboration. GB: You know what I did? I sat down and drew out my impression. Obviously, I Googled everybody, and found out if I didn't know them, or even if I did, I tried to find out the kind of things they liked, the kind of things that sit on their body well, and I would take that information and think, "Okay, now I am dealing with Sally Durant Plummer." So, I kind of sketched out my ideas, and then I met with Bernadette. I know that in the original production Alexis [Smith, who played Phyllis] was in a red, amazing pant palazzo costume, and Sally [played by Dorothy Collins] was in a very bouffant, pale, frothy with dimensional flowers on it, sort of a party dress. We actually completely flipped those tables. Bernadette is going to be wearing a red dress, a very simple chiffon dress—and Jan is wearing a solidly bugle-beaded, very pale gold dress. A lot of those things came out of these discussions. With Bernadette, she said this character has an agenda. She's come back to seduce. She's trying to rekindle this passion that she felt, this unrequited passion. It was requited, but it was fumbled. So it made sense to me that she would put on a red dress. The flavor seemed right. With Jan's character, she's been a politician's wife, she lives on the Upper East Side, she's got a lot of fabulous silver in her dining rooms they discuss in the play. So we did a dress that hopefully looks like Bergdorf Goodman 1970, but it's also a little showy. Actually, a lot of politicians' wives should be coming to the Kennedy Center [to see Follies] because of the neighborhood, and I said to Jan, "They should all be sitting there thinking, 'Damn, why can't I wear that dress? That's the dress I want to wear!'" So it's not quite as showbiz-y maybe, and it's very vulnerable looking, ironically, even though she's a lady who has her armor up in spades. So we'll see—it's always a risk reinventing something, but it's thrilling at the same time. Follies continues at the Kennedy Center through June 19. 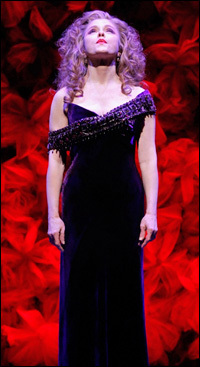 Click here to read Playbill.com's opening night story.